To Isis worshippers, Princess Selene and her twin brother Helios embody the divine celestial pair who will bring about a Golden Age. But when Selene's parents are vanquished by Rome, her auspicious birth becomes a curse. Trapped in an empire that reviles her heritage and suspects her faith, the young messianic princess struggles for survival in a Roman court of intrigue. She can't hide the hieroglyphics that carve themselves into her hands, nor can she stop the emperor from using her powers for his own ends. But faced with a new and ruthless Caesar who is obsessed with having a Cleopatra of his very own, Selene is determined to resurrect her mother's dreams. Can she succeed where her mother failed? And what will it cost her in a political game where the only rule is win-or die?" We first meet Selene as she comes to the realization that her world is about to change forever. With the suicide of her mother and father, and Egypt being conquered by Rome, Selene and her brothers have no choice but to become the "prisoners" of Octavian. Paraded through the streets of Rome during Octavian's triumph, Selene is disgusted when she must bow to Octavian and plead for their lives. Taken by surprise, Octavian shows mercy and welcomes them into his family, but little did Selene know her actions were not by chance but orchestrated by Octavian's cold and calculating mind... and it is just the beginning of his theatrical play. As Selene lives amongst the other children of rulers who have been conquered by Rome, she tries to find a way to make the most out of her captivity, but when her beloved goddess Isis begins using her as a vessel of communication, not only is her life in danger but the whole Isiac faith. Desperate to save the lives of her remaining family and claim what is rightfully hers by birth, Selene must navigate her way through a court of intrigue and learn how to use Octavian's calculated nature for her own purpose. 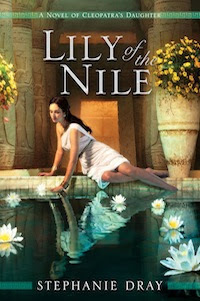 As soon as I began reading Lily of the Nile, I was captivated by the intense emotions the book relayed. From the start I was empathetic to Selene, and my heart went out to her as she watched her world crumble before her. Not only did I feel a strong connection towards Selene, but I was surprised to find myself captivated by Octavian. He was such an intriguing character, extremely complex and utterly mind boggling; I did not know whether to admire his cold brilliance or shake my head at his self serving plots. Having read Michelle Moran's take on Selene with her novel Cleopatra's Daughter (my review), I was intrigued to see how Stephanie Dray's version on Selene's early life would compare; I am thrilled to say Dray's novel held its own and was a delightful read. The whole feeling of the book was different than Moran's; while Moran weaved a brilliant novel focused on historical fact and detail, Dray brought a mesmerizing sense of magic to her novel with all the mystical beliefs of the Ancient Egyptians. With Lily of the Nile, Stephanie Dray has created an intriguing and delightful novel that captures the readers attention and holds it until the very end, leaving the reader craving more... and more we shall have! This is the first book in the Cleopatra's Daughter Trilogy, with the second, Song of the Nile, scheduled with a tentative release date of Autumn 2011.